Library computers and laptops are available on a first-come, first-served basis. Laptops are available for check out at the Ask Desk. Individuals ages 15 and older with account in good standing. Individuals under the age of 15 must have signed parental consent, see Circulation for an Internet Permission Form. Those without a library card can get guest passes at the Ask Desk. Each individual is allotted four hours of use per day, provided no one is waiting for a computer. Equipped with Microsoft Office 2013, Chrome, Internet Explorer, Mozilla Firefox, Adobe Reader, and photo editing software. We do not filter Internet content or store any personal data. When your allotted time is up or when you log out, files and data are deleted and cannot be retrieved. It is recommended that you save your work to a flash drive. Ask Desk staff can provide limited computer assistance. 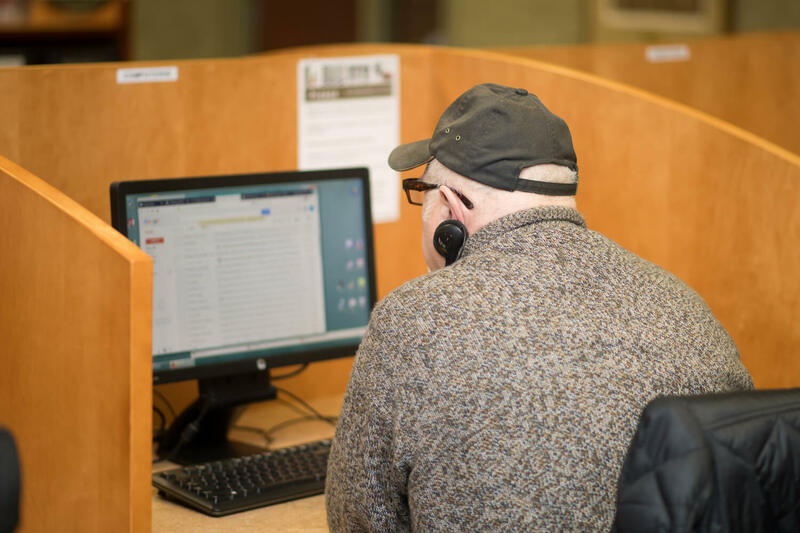 If you are new to using the Internet or other programs on the computer, we recommend you attend one of our free computer classes or fill out the Get Help form for one-on-one assistance by appointment. Wireless Internet access is available to the public. See Wireless Internet Use Policy 4.6 for complete details about privacy and security. Wireless printing from personal devices is available using Print From Anywhere. Printouts can be retrieved at Circulation for $0.10/page, black & white only. Types of files that can be printed. Two scanners are available in the Copy Room. They allow for saving to a USB drive and email. The HP flatbed scanner will allow for printing and scanning of photos, slides, and negatives. We have two black & white copy machines and a fax machine available in the Copy Room. Faxes cannot be received at the Library.